I know pumpkin cookies are out of season but they are a favorite in my house all year long. Over the years I have tried different recipes but always go back to the original recipe I created. Some recipes call for nuts, chocolate chips, and raisins. However, my boys love the soft and spongy texture with the earthy flavor of pumpkin and its complimentary spices (ground cinnamon and nutmeg). 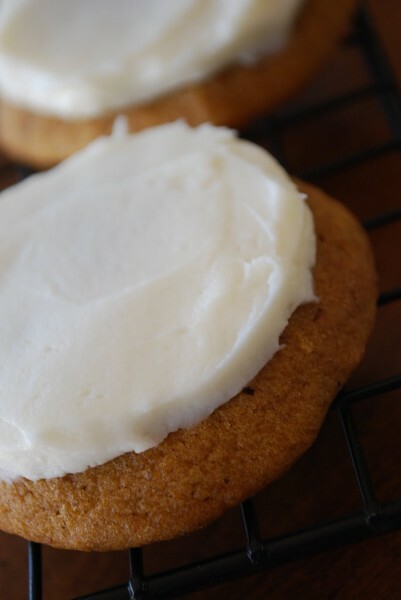 I frost these cookies with either a sweet tangy cream cheese frosting (can is ok), or a can of your favorite vanilla frosting. To give it a rustic homemade look I also grate fresh nutmeg on top of the frosted cookies. Using a mixer, beat the butter until smooth. Beat in the white and brown sugars, a little at a time, until the mixture is light and fluffy. Beat in the eggs 1 at a time, then mix in the vanilla and pumpkin puree. In a large bowl, whisk together the flour, baking soda, salt, cinnamon, ginger, nutmeg, and cloves. Slowly beat the flour mixture into the batter in thirds. Scoop the cookie dough by heaping tablespoons onto the prepared cookie sheets and bake for 15 to 20 minutes, or until the cookies are browned around the edges. Remove the cookie sheets from the oven and let them rest for 2 minutes. Take the cookies off with a spatula and cool them on wire racks completely before frosting.